A research team at the ECB has issued a paper attempting to explain the origins of financial crises. This has of course been an enduring topic of analysis ever since the fall of Lehman, and just about every economist in the world has now had a go at it, with varying degrees of success. The ECB's paper makes a valiant attempt to fit the financial system into a DSGE model of the economy that previously ignored it. The maths is fearsome and I admit I skipped much of it. But they draw some important conclusions. Very early in the paper they accept the prevailing wisdom that financial crises are endogenously determined - in other words, they happen as a consequence of behaviour within the system, not because of external shocks to it. Now this immediately causes a problem with the model. DSGE models work on the basis that shocks are exogenous - sort of like meteorite impacts on life on earth. But using the same analogy, an endogenous crisis would be CAUSED by the behaviour of life on earth. Attempting to use a DSGE model to explain the effects of the behaviour of humans on their own behaviour is enough to drive a serious economist to drink. Admittedly there are shocks in the model, but adverse ones are regarded as secondary and the causative positive supply-side shocks they postulate happen some time before the crisis itself. They cause the buildup of the behaviour that leads to the crisis, rather than the crisis itself. This I think is an important insight, and I commend the ECB economists for sticking to their guns despite the considerable difficulty in using a model that on the face of it looks inappropriate. They outline a typical run of events leading to a financial crisis as follows. A sequence of favorable, non permanent, supply shocks hits the economy. They don't say what these are, but candidates might be reductions in key interest rates or falls in oil and raw material prices. The resulting increase in the productivity of capital leads to a demand-driven expansion of credit that pushes the corporate loan rate above steady state. As productivity goes back to trend, firms reduce their demand for credit, whereas households continue to accumulate assets, thus feeding the supply of credit by banks (presumably to households). The credit boom then turns supply-driven and the corporate loan rate goes down, falling below steady state. By giving banks incentives to take more risks or misbehave, too low a corporate loan rate contributes to eroding trust within the banking sector precisely at a time when banks increase in size. The credit boom lowers the resilience of the banking sector to shocks, making systemic crises more likely. When counterparty fears in the interbank market rise too high, the market freezes. (I've used liabilities instead of debt in this case because of the ONS's observation that PNFC balance sheets were actually more highly geared than acquisition of debt and assets during the period suggest. The whole ONS paper is well worth a read). 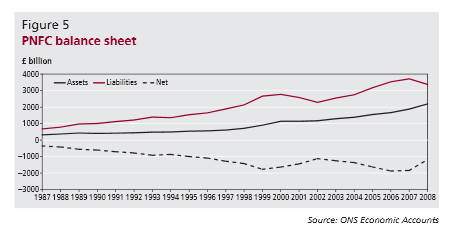 So household balance sheets were inflating overall. This doesn't necessarily invalidate the authors' conclusions, but the omission of household debt from their analysis I think weakens it. And perhaps more importantly, there isn't any evidence from this pair of charts that households continued to accumulate assets after corporate borrowing started to fall. Both household assets and corporate borrowing seem to have fallen at the same time. However, the authors are right about the increasing size and riskiness of bank balance sheets. I don't need to produce a chart for this, since the accumulation of both household and corporate liabilities in a bank-dominant lending model such as exists throughout Europe must result in inflated bank balance sheets. And the increasing riskiness of bank lending and trading in the run up to the financial crisis is firmly established. The shock to productivity caused by the financial crisis is very evident in this chart. 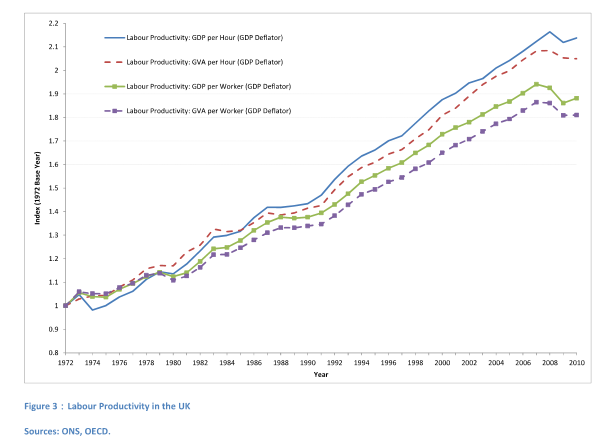 But more importantly, it suggests that the productivity rise prior to the crisis was unsustainable. In which case the UK economy cannot realistically return to that rate of productivity growth: a shallower curve is both more likely and more desirable. The question is whether it can bounce back to the level it reached in 2008 and then grow more sustainably. I'm not convinced. It seems more likely that productivity growth has dropped to a new, lower (and shallower) trend. This has serious implications for output and for economic recovery. But I digress. The ECB team suggests that declining corporate borrowing and a fall in productivity lead to unsustainable (bubble) growth of household and bank balance sheets, causing increasing risk which ultimately ends in a market freeze when counterparties think the risk is too great. I don't buy this. Neither corporate borrowing nor productivity started to fall until the subprime crisis in the US, by which time household and bank balance sheets were already over-inflated and high risk. It is difficult to establish any likely causative relationship between productivity fall and increased riskiness, except in the early stages of the crisis itself. I wonder what exactly the ECB team regard as the crisis: perhaps they are referring only to the fall of Lehman and subsequent meltdown. If so, to my mind they are only looking at half the event. Lehman happened towards the end of the financial crisis, not at the beginning. However, the remainder of their analysis is excellent. Their DSGE modellling establishes the following principles. Financial crises are associated with unusually high and rising productivity. "One striking result that emerges from this experiment is that the typical banking crisis is preceded by a long period during which total factor productivity is above its mean. In some 20% of the cases, crises even occur at a time when productivity is still above mean. This reveals one important and interesting aspect of the model: the seeds of the crisis lie in productivity being above average for an unusually long time. The reason is that a long period of high productivity gives the household enough time to accumulate assets beyond the banking sector's absorption capacity...."
So a highly productive household will save more. 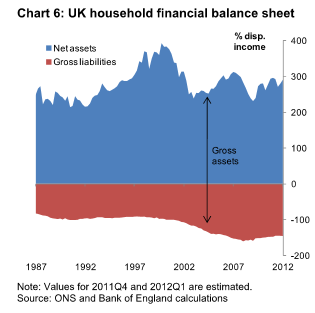 But Broadbent's chart shows that households are accumulating both assets AND liabilities. Assets, after all, include houses, which most people buy with debt (mortgages). And there is no reason to assume that this behaviour is homogenous, either. The bifurcation of the labour market that has been going on for well over a decade now suggests that high earners acquire net financial assets, while lower earners acquire net financial liabilities (debt). Households' balance sheets are polarised between high-debt and high-savings, with a substantial proportion of households having both - with savings mostly in illiquid form. This places their balance sheets under pressure when income falls due to productivity collapse. I think the authors miss this. Sustained periods of above-average productivity feed credit booms, creating large financial imbalances that are ultimately unstable and cause crises to break out without exogenous shock. "We measure financial imbalances by the distance between banks' absorption capacity and banks' core liabilities. The smaller this distance, the larger the imbalances, and the less resilient to adverse shocks the banking sector. Typically, a distance of less than, say, 5% reflects large fi nancial imbalances..... 70% of systemic banking crises break out in the year after fi nancial imbalances have reached this threshold. This result con firms that most crises in our model break out endogenously, without an adverse exogenous shock happening at the same time." Or putting it another way, high gearing in banks increases their risk. Well, who'd have thought it. High levels of household savings in good times are destabilising. ....in our model, crises are more likely to occur in good, rather than in bad, times. This is due to the asymmetric e ffects of permanent income mechanisms on fi nancial stability over the business cycle. Bad times in the model are typically times where productivity is low and the household dis-saves....the fall in savings makes (all things being equal) crises less likely. Hence, in bad times, the dynamics of savings tend to stabilize the financial sector. In good times, in contrast, productivity is high and the household accumulates assets, which....makes crises more likely. In this case the dynamics of savings tends to destabilize the financial sector. This asymmetric e ffect of savings is the basic reason why credit-boom led crises are so prevalent in our model. So their argument is essentially that high levels of household savings (presumably including physical assets such as houses, which are used as collateral against household borrowing) increase the riskiness of the financial system. This is particularly interesting, because it is the opposite of what is normally argued. But household savings are the liabilities of the banking system, and secured lending depends on good collateral, so a high level of household savings increases banks' fragility when also associated with low levels of loss-absorbing equity - the second bullet point above. 1) Risk averse economies are more prone to crises. T|his is really important. Prudential saving by households fearing a crash actually makes the crash more likely, and makes its effects worse. 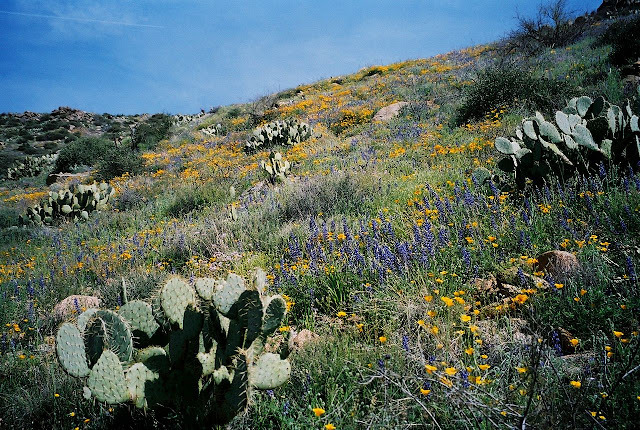 The quest for safety perversely creates the very disaster that the savers fear. Moneyweek readers, please take note. 2) Economies with a highly elastic labour supply are more prone to crises. This also is really important, especially given the prevalent belief that flexibility in the labour force is a good thing and countries should undertake labour market reforms to increase flexibility. This research suggests that flexibility in the labour force increases the amplitude of the boom-bust cycle, as households work more in good times and less in bad times. That suggests that there is a trade-off between business efficiency and economic instability. Some loss of business efficiency due to labour market inelasticity might be a good thing. 3) Contract enforceability and efficient banks reduce the likelihood of crises. (Though if crises do occur they can be worse). If the bulkheads on the Titanic had been higher the ship wouldn't have sunk. 4) Higher uncertainty is conducive to crises. This bit is really interesting. They suggest that technological shock influences the likelihood of crisis: adverse technology shocks increase it, because households save prudentially and corporate borrowing falls, making the financial sector more fragile. Positive technology shocks, on the other hand, decrease the likelihood of crisis. The question in my mind is how to distinguish positive and negative technology shocks: "robots ate my job" is a negative shock to households but potentially a positive one for firms if their return on capital improves as a result. The authors don't develop this enough and there is room for lots more research on this subject. Intuitively it seems likely, if the primary cause of financial instability is high levels of household saving reducing banks' loss absorption capacity, that general uncertainty about the future would make crises more likely unless government applied pressure to banks to maintain or increase loss-absorbency. And that I think is where we are now. We are in a period of uncertainty about the future and fear of technological change. Our economies are highly risk-averse, as is evident from the crashing yields on "safe haven" assets such as high-quality government debt and currencies. Elasticity is increasing in the labour force as self-employment, temporary and casual working increases and permanent full-time employment falls. And corporates, households and government alike are paying down debt and trying to save. The only ingredients missing are bank lending and productivity growth. Sadly the authors don't model the present stagnation as a repressed financial crisis. The ECB researchers' analysis amounts to a flawed re-engineering of Minsky's financial instability hypothesis (which they briefly mention at the beginning of the paper) and Goodwin's growth cycle model (which they don't mention at all). I've therefore added a link here to Steve Keen's paper on the same subject. He uses chaotic system dynamics rather than a DSGE model. *I'm using UK data throughout this post because the paper is written from a European perspective and the UK is the principal financial centre in Europe. US lending markets are very different from European ones because of the dominance of capital markets. Europeans, including the UK, rely much more on banks. Great stuff as usual Frances. Yes thanks for the summary but some of the ECB analysis seems a bit vague as you point out. Thinking about crises following periods of increasing productivity could the fact that gains from this productivity are not going to labour be part of the problem? If the gains are going to small percentage of the rich and corporates, rich will save proportionatly more and corporates borrow than the general population. Fiona, much of the evidence at the moment is that gains go to highly-paid workers rather than shareholders - so the labour market itself is splitting in two. Shareholders - many of whom are ordinary people, through their pension investments, not the "rich" - are also being squeezed. It's not meaningful to talk about gains going to "corporates". Corporate profits go to management, workers, shareholders, customers (in the form of lower prices), government (through taxes) or are reinvested in the business, which benefits future management, workers, shareholders, customers, government.....My gripe is that management appears to be benefiting disproportionately at the expense of the other stakeholders. That's what the labour statistics show and why I provided the link to my post on labour market bifurcation. At present companies are sitting on high cash balances, but they also have high debts. I was thinking about large profitable corporates with cash piles not being re-invested. Had assumed some profits/ cash would be used to pay down debt. The fact that corporates are sitting on cash and NOT paying down debt is a mystery rather similar to the productivity puzzle....lots of people have theories as to why this is happening but no-one really knows the answer. Read this FT Alphaville post and follow the links to Cochrane, Cowan and Roche, and also to Karl Smith and Scott Sumner in the comments. Apple has no debt to repay and is responsible for a significant proportion of the world's corporate cash pile (and probably even more of the incremental adding to it each year). It could be said that people who buy an iPhone are making themselves redundant. He covered all this 40 years ago. I've read Minsky, thanks. Minsky did not do a DSGE model of his hypothesis. The ECB researchers mention Minsky early in their paper. But their analysis does not stem from his work - it appears to be completely independent and reached via a different (and much more difficult) route. They also deduce the critical importance of productivity growth from first principles, despite the fact that this had already been more-or-less covered by Goodwin. Reinventing the wheel is the modus operandum in Europe, it seems. But this is an important piece of research from the ECB, given the dangerous situation in the Eurozone and the apparent blindness of the political and monetary authorities to the risks they are running. I've added a link to Steve Keen's paper on Minsky's financial instability hypothesis, which incorporates Goodwin's growth cycle model too. The productivity dip is a bit of a puzzle (and a surprise to me). I can't believe people suddenly lost their ability to do things, so the bulk of the effect must be that they kept being paid with less to do, that is employers didn't shrink the workforce as fast as the demand went down. Also there's a question of timeframe in all these things: a flexible workforce for example is bad in a (sudden) crisis, but it's good in the long term that people can do jobs they're good at rather than being stuck in lifetime jobs they're not good at (which tends to make them safe but miserable as well). Same "robots ate my job" also means "cool now I have a washing machine I can spend my days doing nuclear physics instead of washing underwear". As for people saving too much in aggregate, I think the turnaround is near. It seems to me that American consumers are too impatient to keep at it much longer. You can also see it when you listen to the corporate noise, the paying down debt/sitting on cash thing is getting tired as well, they're largely done cleaning up the noughties' excess and are ready to move on. And you need just enough people saving less to tip the balance and get the ball rolling (and save Europe in the process). Isn't "Rising productivity" just a euphemism for rising returns to capital? 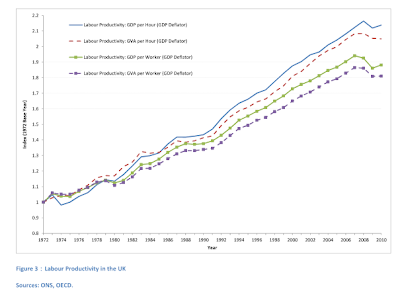 Falling productivity is a rising return to labour. Makes sense. Uncertainty and risk aversion both increase incentives to hedge. 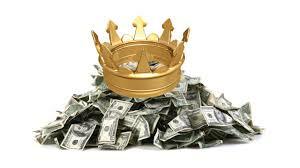 An increase in hedging can only be accomplished in aggregate by balance sheet expansion since by definition an increase in hedging must be an increase in the exposure to the real assets/equity of others. I suspect this is depends on the rate of change of technology, the rate of change of environment and the rate of change of available energy inputs to the economy. When these things are in flux labour must be more flexible. However when these things are in flux that must mean increased likelihood of shock due to the rate of change. So this is maybe more related to the pace of change rather than the labour flexibility which is more likely a symptom of fast change. 3) Contract enforceability and efficient banks reduce the likelihood of crises. The link between extreme efficiency and lack of robustness is well known in ecology and complex systems. So this makes sense. This all suggests that maybe the crisis is ultimately the result of one thing - rapid technological and social change which lead to uncertainty and increased efficiency with the consequences noted above. 1) Unusually high and rising productivity, relative to national history? That's catchup growth fueled by easy international credit and importation of international advanced machinery. See: Spain, Brazil, etc, etc, all the way to where China is now, with Michael Pettis poking in its side gently. 2) Sustained period of above average productivity are *fueled* by unsustainable credit. It's simply not easy to grab easy bucks without leverage. You have to buy out politicians, exercise monopoly behavior, or control resources (or all of these elements). 3) High level of household savings usually happen because authorities force those savings to be high via real negative interest rates, or effectively so. Or they happen because that particular country has few services and no safety net at all. In either case, this is not a sustainable pattern. There eventually becomes no safe place to put money at all, for lack of new viable investments. And of course, a wretched third world country is prone to getting pnemonia from international financial flus, or some other disasters wipes out whatever middle class' savings exist, and boom, economy goes into reverse. 1) Risk averse economies are NOT more prone to crashes. That's crazy. You need to say this in a different way. Fearful economies with little trust are more prone to crashes. It's self reinforcing because people know that there's a crash coming! That's why people are fearful. In a normal economy, people seek yield. Period. Bulls make money, bears make money, and you can be successful in either aggressive or conservative fashion. 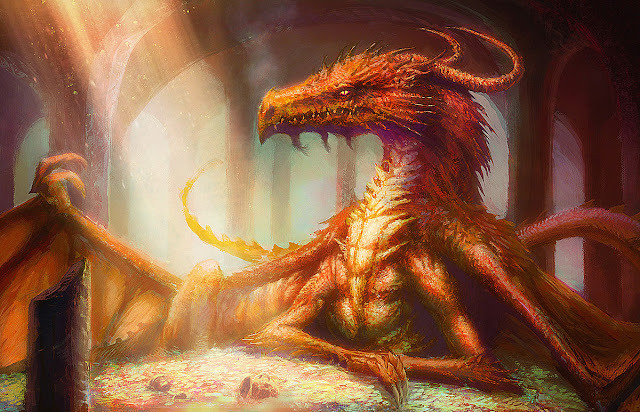 When nobody takes the other side of a trade, even with very favorable bait on the hook, that usually means there is a crisis--not that the specific behavior causes the crisis. I can think of how conservative behavior can cause crisis, but those are almost always an outcome of resource curses, when the safe bet drives out any other more risky proposition. In a sense, the world is all hooked up on the most complex resource curse ever, essentially channeling funky backwardation in primary goods and energy into financial products that backs up national bonds. 2) That's true. Mostly because highly inelastic labor supply are usually an artifact of repressive political systems. Otherwise, people would try to emigrate, find hot sectors, organize, etc...Business efficiency here should be noted as pretty words for a fascist sentiment. A flexible labor system usually means that people can add labor to underutilized capital. There is usually a pretty big drive for that to happen--and you see squatter's movements and creative drug trades, so forth and on. When labor is really inflexible, there is some kind of command economy going on, overt or subvert, even when it's enforced by, say, lack of cash on Main St.
3) In virtually every go-go period, contract enforcement and general common sense declines, and this is usually encouraged by the elites. Think Alan Greenspan and his encouragement for people to switch to adjustable rate mortgages. In general, easy credit *always* does this. It almost doesn't make sense to anticipate continued discipline in manufactured bubbles. The Cossacks answer to the Tsar. 4) Eeeeh. I don't think there are technological shocks per se, rather than the shocks generated by creating infrastructure for said technological advancement. The usual shocks have to do with advancements that changes land values, like railroads or standard box cargo shipping. And much of that has to do with new flavors of corruption among a general dispossession of land or other newly useful resources (like water rights) by elites. I don't think technology really does much to genuinely lower the economy or wages directly. Just new tools for a previously existing elite rapacity. Robotics doesn't even have to lower manufacturing jobs. Just that those new capital resources weren't used that way. Re Carney's claim that monetary policy is more "nimble" than fiscal, anyone know of any decent evidence to back up this claim? I'm not sure you meant to leave this comment on this post - the Carney quote is on my "floors & ceilings" post! There is a general view among neoclassical economists that fiscal policy works only in the long run. Their ideal is that fiscal policy should be set up to offer countercyclical support over the business cycle and then left alone. Automatic stabilisers are about the only role they see for fiscal policy. Hence my comment on my "Floors & ceilings" post that the role of fiscal tools in monetary policy is a much neglected area. I honestly don't know if anyone has actually researched this. Read Minsky / Steve Keen . DSGE ( equilibrium !!! ??? ha ha ) models so much worse than merely 'flawed'. Frances , you say you read Minsky but had doubts because it wasn't DSGE friendly. This is like saying ,you read Newton but disregarded on the basis he wasn't Ptolemy compliant. Economics is patently obviously not an equilibrium system. In technology sector China is surpassing even the US, in fact, China is leading the market of Smartphones. Global X NASDAQ China Technology ETF (CHIB ETF) is designed to reflect the performance of the technology sector in China. Invest in CHIB fund that includes computer services, internet, software, computer hardware, electronic equipments, semiconductors, and telecommunications equipment.